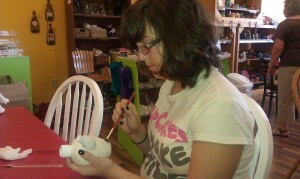 Fired Up is a paint your own pottery studio located in Mt Juliet, TN. 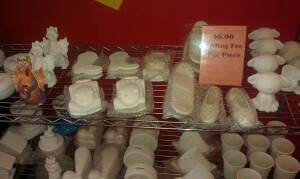 There is a 6 dollar sitting fee per piece plus the cost of the piece you choose to paint. 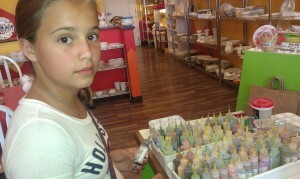 They offer a large selection of small, kid-friendly items priced under 12 dollars. 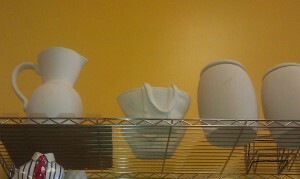 They have a few super large pieces like pitchers and canisters priced around 80 dollars. Have a Grandparent birthday coming up? 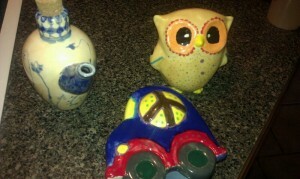 You child could make them a custom cookie jar or ice tea pitcher. There is also a large selection of knick knack items priced under 20 dollars, and ceramic charms are available for jewelry making. Once you choose your piece, one of the employees will help get you set up at a table. They will show you where the paints, brushes, and tools are located and give you advice on getting the best results. 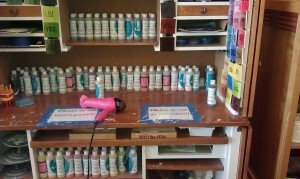 There is a huge variety of base coat paints plus detail colors available. They politely request that you don’t waste paint but there is no actual limit on the amount or number of colors that you can use. I know some other ‘paint your own pottery’ places charge extra for paint colors so this is a great value offered at Fired Up. Pick a color! Or twelve! After you paint three coats on your piece (with a blow dry in between), then you can move on to more detailed painting with their stencils and/or paint pens. Fired Up offers bottled water and soda for purchase. They also have FREE popcorn that they pop right in the studio. So, in addition to a nice snack, the place smells great. 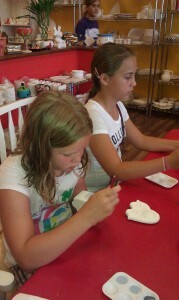 One great ‘unadvertised’ perk of Fired Up – the owner will allow you to leave a child there to work on a piece. This DOESN’T mean you can drop your 4 year old twins there for free babysitting but if you have a young teen who is serious about their art, they can paint for as long as they want while you get some shopping done in the mall. Once you are done painting, Fired Up does the rest. 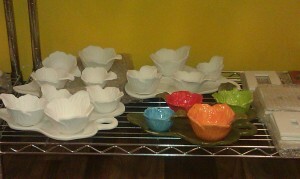 The completed pieces are ready for pick-up a week after you finish them. They offer coupons in your local Entertainment book. They are also available to book for parties. Looking for a used potters wheel or where to find one-inexpensive. Thank you!